The Big Texas Toy Run pictures here. Just so you know, The Big Texas Toy Run, is the largest one day motorcycle event for charity in the country. And it was BIG, Texas sized even, there were an estimated 40,000 bikes this year which is down from previous years...probably cause it was so damn cold. 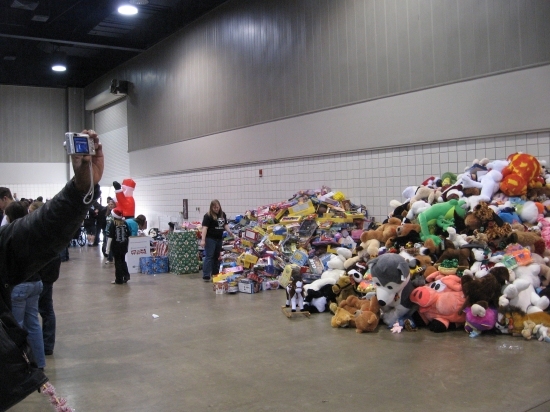 The Big Texas Toy Run has benn happening since 1985 and benifits MHMR of Ft. Worth and MetroCare of Dallas. 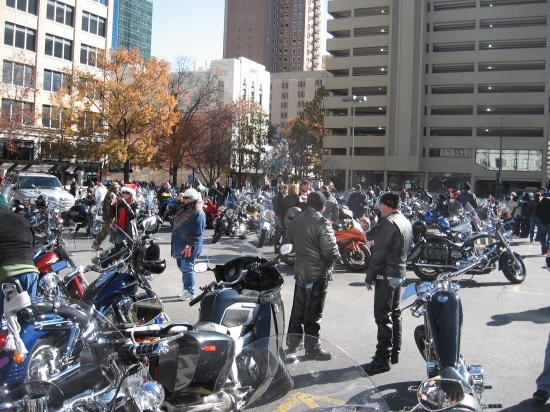 It is also the only toy run that starts in 3 different cities, Fort Worth, Dallas and Grapevine, all the bikes and bikers end the ride in Arlington at the convention center. We arrived, frozen and well at this point wew were just frozen, around 10 in the morning and got our sticker and parked the bike and made a bee line for the Barnes & Nobel(It was warm and had a Starbuck's) After we thawed out we made our way to buy a ride pin and look at all the bikes. There was plenty to see, almost every street in downtown was packed with bikes. About 12:30 w made our way back to our bikes and got ready for the 1 o'clock roll out. We went from Downtown and got on to IH-30. The freeway was lined with people coming out to see all the bikes. Once we got to the convention center in Arlington we parked and made the hike to turn in our toys and find a bathroom.....the coffee wanted out. We enjoyed talking with our friends and just hanging out for a while (and getting warm again) We meet up with some friends and it turned out it was someones birthday so we headed back to Fort Worth for a party at Risky's....but that is another story for another time.